Glycolysis, or how cells break down carbohydrates. Eons of emergent changes and mutations, aided by natural selection, have made it possible for cells to make efficient use of the available energy on this planet. And the source of this energy is the Sun. This entry was tagged Chapter 7: Cellular Respiration, Chapter 9: Glycolysis. Bookmark the permalink. A controlled ‘burning’ of Glucose, otherwise energy would be wasted as heat. Not good for the cell. After reading this post, I understood much better that Glycolysis is the oxidation of glucose. In the process of oxidation, the electrons removed from glucose are transferred to molecules of NAD+ to produce NADH. Also, enough energy is extracted during oxidation to produce a net of two ATP. Many microbes survive using only glycolysis to produce energy. Glycolysis differs from respiration in that it doesn’t require a terminal electron acceptor, like Oxygen, to work, it extracts substantially less energy, and bond energy is transferred directly from molecule to molecule. This post was actually very helpful for my understanding of glycolysis. It especially helped me understand the two main stages of glycolysis: the energy investment stage, which is basically when two existing ATPs are used to make more ATP. And the payoff stage which results in four new ATPs. When we first started discussing cellular respiration I was truly amazed at the complexity of the processes that take place. After watching these videos my understanding of the processes was greatly increased. Never had I imagined that so many different molecules take part of this process. Something I was confused about was chemiosmosis but after reading more on the topic I understood that it involves the pumping of protons through special channels in the membranes of mitochondria from the inner to the outer compartment and through this process the production of ATP happens. I am very grateful for these animations because they make this extremely important process in our bodies seem much more simpler. These videos were extremely beneficial as I was studying for the final test. I honestly believe that as a student sees so many steps and complicated names, he or she will get frustrated with the intricate material, but once they start to watch the videos it becomes a straight forward process, enabling them to acknowledge its true purpose.These videos managed to explain and make a process as complicated as Cellular Respiration,and all its steps, into something basic and simple without losing important details necessary for the process to action. Also, as I got to better understand the actions happening I understood the importance of its outcome. This honestly amazed me, for this process is something we take for granted, thinking it just happens because it does, without sincerely understanding how complicated and meticulous it must be or how truly crucial it is for every organism’s survival. Even when metabolic pathways can be highly convoluted and complex, they’re the best models we have to understand how biotic systems manage energy output and input. (1)	There exist now propositions about everything that might happen in the future. (2)	Every proposition is either true or else false. (3)	If (1) and (2), then there exists now a set of true propositions that, taken together, correctly predict everything that will happen in the future. (4)	If there exists now a set of true propositions that, taken together, correctly predict everything that will happen in the future, then whatever will happen in the future is already unavoidable. (5)	Whatever will happen in the future is already unavoidable. If you are curious about the subject of time—which is very healthy and human—I suggest you read the work of the Argentinian poet, Jorge Luis Borges. As discussing in class, cellular respiration is a complex process that happens in a short amount of time, maybe not even in a second. We don’t necessarily know it but there are millions of processes happening inside our bodies at this precise moment. An example of this is glycolysis, in order for this first process of cellular respiration to take place we have to eat so glucose can enter the cell. We can never lose sight that the whole point of us eating is to get the molecules needed to make more ATP. ATP is the one who produces all the cell’s energy in order to power all its chemical reactions. This videos simplify glycolysis in a more understanding and easy way, meanwhile we can never lose sight that all this is happening because of enzymes that are powering these chemical reactions. We must also keep in mind that this process happens without the presence of oxygen and occurs in the cell’s cytoplasm. I would definitely recommend these videos to a student who doesn’t really understand the process of glycolysis and its importance to our bodies. When we were discussing the first step of the cellular respiration process, which is glycolysis, in class, I was hit by the fact that all these complicated processes take place inside of our body. Some people live their whole life without knowing how extraordinarily complex their body truly is. I find that learning new things about yourself and your body is undoubtedly fascinating. It’s learning how to properly take care of your body in order for these processes to happen.These videos aided me in trying to fully grasp the convoluted subject. 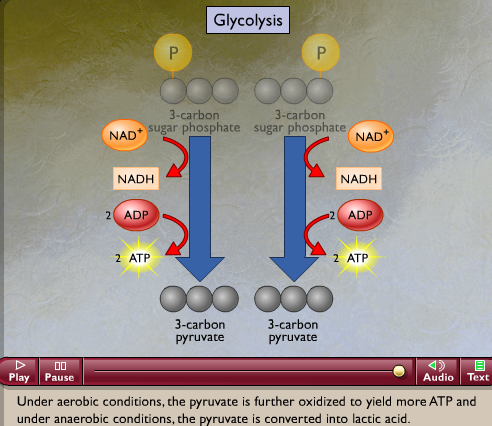 Glycolysis is the metabolic pathway that converts glucose into pyruvates with the production of two molecules of ATP, which is often referred to as the energy currency of the cell and can be compared to storing money in the bank because it is the energy molecule that all cells need in order to do anything within the human body. Thanks for your contribution, Tatiana. Great Crash Course video. Energy is required for all kinds of bodily processes including growth and development, repair, the transport of various substances between cells and of course, muscle contraction. Whether it’s during a 26-mile marathon run or one explosive movement like a tennis serve, skeletal muscle is powered by one and only one compound, adenosine triphosphate. However, the body stores only a small quantity of this energy currency within the cells. So the body must replace or resynthesize ATP on an ongoing basis. Many of us athletes replenish ATP by eating carbohydrates, fats and most important protein.